Is it time for your HVAC Annual Maintenance Spring TX? 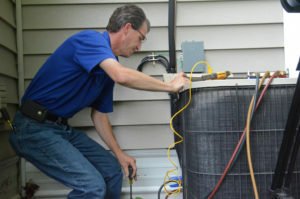 Since Spring experience such unpredictable weather, it’s important to know a company who know the ins and outs of HVAC. Houston Admiral is the company that can handle all of your HVAC needs. We are family owned and operated, and we specialize in residential and light commercial AC Repairs, Heating, Venting, Duct Design, and Air Purification. We are qualified to work on all types of equipment and can serve you at any time, day or night. Our technicians are all certified and licensed. Ultimately, hiring our technicians can save you time and money as well as prevent a lot of stress. Since we are in the Do-It-Yourself (DIY) Era, many people research HVAC equipment and how to install it themselves. However, you could spend a lot of unnecessary money on overpriced equipment because a salesperson stated it’s “Top of the Line.” Furthermore, we recommend that a licensed expert install your HVAC equipment to ensure efficiency, performance, the length of the system’s life. An improper install can add additional stress to your unit and eventually cause it to breakdown before you expect. As a result, you are forced to spend money to repair, or worst, replace a relatively new unit. How To Properly Choose an HVAC Technician? Make sure your technician is licensed and insured. Texas requires HVAC Technicians to gain their license and certifications. Most technicians are EPA and Nate Certified. If he or she is licensed, make sure you ask for the license number and keep it for your records. Also, if you’re working with a company, confirm if they have both worker’s compensation and liability insurance in case something goes wrong. All in all, if they are not certified or insured, you probably shouldn’t hire them to work on your system. If you have decided the make of your new HVAC System, inquire if your technician is familiar with the brand. Although systems are similar, there may be a specific difference in the installation that can sharpen the performance. Try to get references from the technician’s past customers. Speaking with other customers can give you an idea of the professional he or she is and the standard of work they deliver. Find out if the company or technician honor refunds, warranties, and guarantees on their work. Sometimes, the outcome of a job is different than what you initially expected. You want to know your options before the installation is complete to prevent an overall bad experience. If you follow these suggestions, you should be able to make a confident and sound decision on deciding a company or technician for your HVAC needs. The qualifications of an HVAC Technician is essential. As a result, we make sure all technicians are certified by state law and NATE. We have serviced the area since 1990, and our motto for every client is “We spoil you with service.” We are confident in our technicians and know they will reflect our mission through there customer service and their work overall. Our operation is 24 hours a day so we can promptly and adequately service our clients. For more information, contact us at 281.876.9400 or visit our website here. 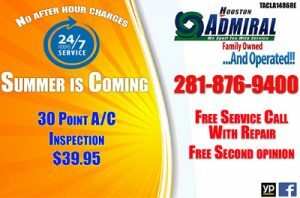 Contact Houston Admiral for your HVAC Annual Maintenance Spring TX today!!! The Romans used the first heating system named the “Hypocaust.” The system sent heat through the walls and floors of wealthy Roman homes. Willis Carrier designed the first air condition unit in 1902; However, it was not initially designed for cooling. The unit was designed to prevent the paper in his publishing house from expanding and contracting. Charles Gates built the first fully air-conditioned home in Minneapolis in 1913. The amount of energy used for air conditioning is equivalent to the amount of energy the African continent uses overall. Many people would gather in theater houses, not just for the film but also to enjoy to cool air inside in the early 1900s. As a result, air conditioning contributed to the success of the movie theaters in the early twentieth century. Edwin Ruud invented the automatic tankless water heater approximately a century ago. The Orcoquiza Native Americans inhabited the area now known as Spring. They were first visited by the Spaniards in 1746. William Pierpoint established a trading post on nearby Spring Creek. Great Northern Railroad Workers were laying tracks from South Texas to Houston. After a brutal winter, the workers reached the area during Spring Time. Once Winter ended, the overjoyed workers named the city “Camp Spring” in appreciation of the Spring season. Camp Spring became a settlement and platted in In 1873. Eventually, they dropped “Camp” from the name and Spring became the base of the railroad workers’ operation. By 1884, Spring had two steam saw and grist mills, two cotton gins, three churches, several schools, and a population of 150. Spring became a major switchyard with fourteen truckyards and 200 rail workers at the beginning of the 1900s. By 1910 the population rose to 1,200. In 1912, The Spring State Bank was established. Rumor has it, Bonnie and Clyde were responsible for the multiple robberies in the 1930s. In 1935 it was consolidated with the Tomball Bank. Today, Spring’s population is approximately 54,298 residents. Spring, TX is located in two counties – Harris County and Montgomery County and is 45 miles north of Houston. The children of Spring attend schools within three public school districts – Conroe School District, Klein School District, and Spring School District. Subdivision deed restrictions are extremely important because there are no zoning laws in Spring. Old Town Spring is one of the top attractions in Texas. For more information about this city, visit the official website here.